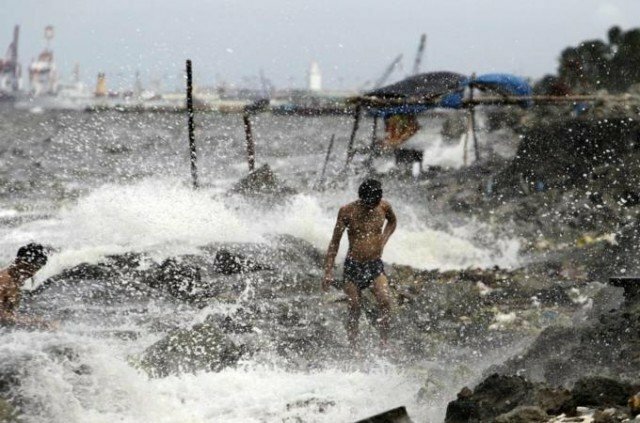 Villages have been evacuated, ferries suspended and flights cancelled in Philippines and Taiwan as Typhoon Usagi goes through the Luzon Strait which divides them. Meteorologists say the storm is the most powerful this year and will bring a cumulative rainfall of 39in as it heads towards China. The authorities there have announced a red alert ahead of the expected arrival of the storm on Monday. The US Navy’s Joint Typhoon Warning Centre said on Friday that Usagi was packing sustained winds of 150 mph, with gusts of up to 185 mph, making it the equivalent of a strong category four Atlantic hurricane. Taiwan is reported to have deployed more than 1,600 soldiers in “high risk” areas prone to flooding and landslides while placing 24,000 others on standby. Authorities in the Philippines are reported to have evacuated nearly 250 people in the northern agricultural province of Tarlac, while ferries are restricted to their ports. There are particular concerns about the impact of the storm on the Batanes islands in the north of the Philippines, with warnings that large trees could be uprooted, plantations flattened and power and communications severely disrupted by flash flooding, landslides and storm surges. The emergency services have been put on heightened alert, with the Red Cross stockpiling first aid kits and food packs in some areas. “Damage to affected communities can be very heavy,” the Philippine Atmospheric, Geophysical and Astronomical Services Administration said. The National Disaster Risk Reduction and Management Council said Usagi would cause intense rainfall of 0.4in – 0.7in per hour within a 435 miles range. Emergency and health personnel in some provinces have also been placed on standby, the Council said. Meanwhile, Taiwan’s Central Weather Bureau issued a land warning on Friday morning, and forecast heavy rainfall for northern and eastern Taiwan. Usagi was projected to make landfall in southern China on Sunday with its outer edges expected to hit the coast of Guangdong and Hong Kong. The storm is forecast to weaken by Sunday with maximum sustained winds of 98 mph. China’s State Oceanic Administration has issued a class I emergency response for the typhoon, its highest maritime disaster response level, state media report. China’s National Meteorological Centre has also issued a yellow alert in its weather warning system. In August, at least two people died and thousands lost their homes after Typhoon Utor hit the northern Philippines.